At Little Prairie, children are important. From our Safe Sanctuary Policy and initiative which seeks to provide a safe space for children through policies and volunteer screening to our programs which allow meaningful opportunities for children to grow in their faith, Little Prairie is a place that is welcoming to all ages. Every Sunday children are invited to join in worship with our weekly children's sermon during worship. And our nursery is staffed throughout the year with screened volunteers to offer age-appropriate activities for our youngest worshipers. 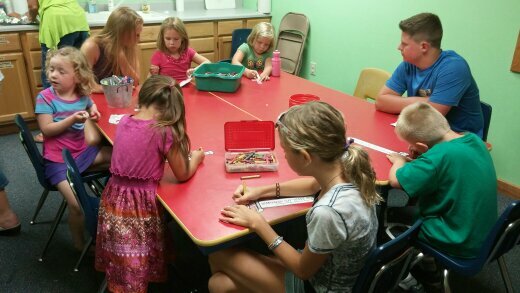 Sunday school classes offer spiritual enrichment for kids ages 2 to 12 from September to May. Vacation Bible School is a highlight of the summer and offers opportunities to invite friends and neighbors. Throughout the year, family events also bring together children and families together to worship, learn and serve. At Little Prairie we offer spiritual education for our youngest to our least youngest. Your kids are important to us! We desire to provide a safe and fun learning environment for your kids to grow in their faith as they learn about Jesus! While parents are at other Wed small groups, kids will have fun in their own program… crafts, Bible Lessons, games. This is a ministry intended for kids whose parents are involved in small groups, but friends are always welcome!